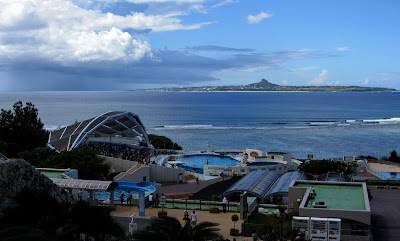 Way back when I first went to Okinawa (November, 2005) I visited the Churaumi Aquarium I think I posted a picture or two. I neglected to post one of the huge aquarium window. This tank is massive. It holds 3 to 4 whale sharks and hundreds (thousands?) of other fish. At the time it was the largest aquarium window (and the largest acrylic window period) in the world...might still be. I've seen a few aquariums, and this one is one of the best. Here's a shot of the tank window...it must be more than a foot thick. Here's an update. The window is 8.2 by 22.5 meters and 60 cm thick. That is about 27 by 74 feet and 24 inches thick. That big thing is a whale shark. You can also see a manta ray. Really cool place. 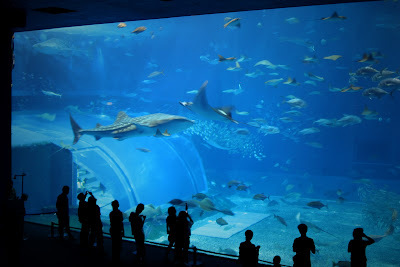 This next picture is an over view of the aquarium...the tank for the performing pilot whale and dolphins. 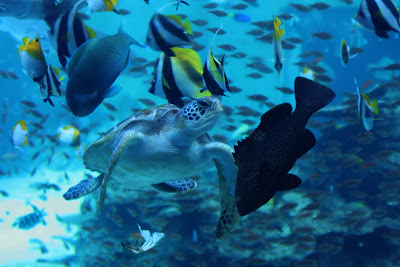 They also have sea turtles...lots of them. He's looking a bit lost...big pond. Like I said, it is a really cool place. A must see if you ever get to Okinawa. I have more pictures I've never posted...stay tuned.